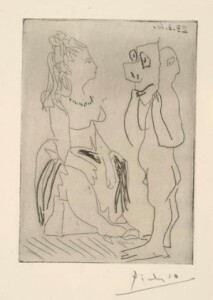 “Homme debout avec masque devant femme assise” is a dry etching by Picasso. It requires to be displayed out of the way of direct sunlight to reduce fading. This prescient piece suggests the duplicity of the deal Picasso’s granddaughter, Maya Widmaier-Picasso, would someday make. This entry was posted on Wednesday, March 2nd, 2016	at 10:07 am	and is filed under . Both comments and pings are currently closed.